Le Laboratoire vous convie à son dernier midi-rencontre de la période d'automne. Thomas Soetens, artiste visuel, et Kora Van den Bulcke, architecte, réfléchiront aux liens entre architecture et technologie. Soetens et Van den Bulcke sont les deux fondateurs de Workspace Unlimited, un collectif international d'art médiatique, explorant la création de mondes virtuels et d'installations interactives. La présentation se fera en anglais, mais la période de questions sera bilingue. Au plaisir de vous y voir en grand nombre! As technologies guide the way we experience and conceive of space, Workspace Unlimited explores Hybrid Space with the unrealized potential of game environments to simulate and reshape architectural spaces. This ongoing research investigates and expands our understanding of the relationship between space and technology, as their simultaneous and reciprocal existences continue to invade both our real and virtual spaces. In this way, Hybrid Space challenges traditional conceptions of space and time, reality and simulation, and perverts the unidirectional implication of the real and the simulacrum. 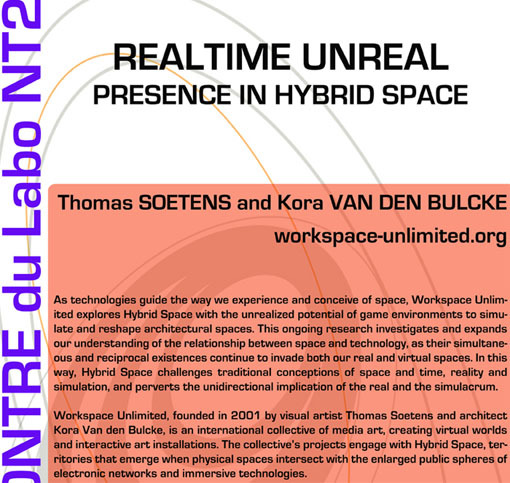 Workspace Unlimited, founded in 2001 by visual artist Thomas Soetens and architect Kora Van den Bulcke, is an international collective of media art, creating virtual worlds and interactive art installations. The collective’s projects engage with Hybrid Space, territories that emerge when physical spaces intersect with the enlarged public spheres of electronic networks and immersive technologies. Workspace Unlimited is frequently invited to participate in lectures and presentations, and has been commissioned to create original large-scale works and site-specific installations by leading media art institutions and museums around the world.